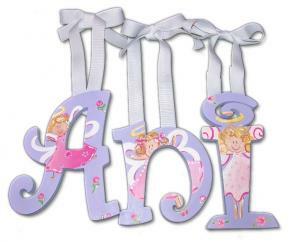 Little Angel Wall Letters for Girls - This is the perfect wall letter design for your little angel. Our artists have handpainted sweet angels to watch over her day and night. We can customize the colors or design on our angel wall letters to coordinate with your little girl's bedroom. Each letter is handpainted with top quality paints and sealed with a non-toxic, non-yellowing varnish to en sure that your little girl enjoys her personalized wall letters for years to come. Full Description Little Angel Wall Letters for Girls - This is the perfect wall letter design for your little angel. Our artists have handpainted sweet angels to watch over her day and night. We can customize the colors or design on our angel wall letters to coordinate with your little girl's bedroom. Each letter is handpainted with top quality paints and sealed with a non-toxic, non-yellowing varnish to en sure that your little girl enjoys her personalized wall letters for years to come.